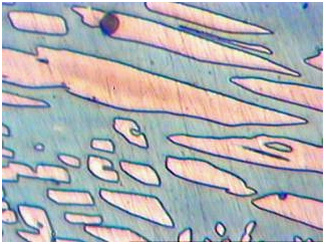 Metallic phase that may occur at temperatures between 400 and 550 °C in non-corroding steels (fig. 1). The χ phase is undesired and promotes embrittlement. Additionally, the ductility and the corrosion resistance of the steel is reduced. The metallographic designation for this phase is Fe36Cr12Mo10. It features a body-centered cubic (bbc) lattice with 58 atoms per elementary cell. The molybdenum atoms with the largest volume per atom are on the lattice positions. The Chi phase occurs at steels with a chromium content of more than 15 %. With 0.26 %, the carbon solubility of the χ phase is considerably larger than in the Sigma phase. Proper heat treatment prevents the diffusion of such phases.